Last week in this email we talked about the negative effects of lawn poisons on birds, bees, and other creatures. This weekend I noticed that dandelions are starting to flower in my neighborhood. This plant is the cause of more toxins being dumped on our good earth than any other. What can you do if, like me, you are married to a man who has recently retired and is about to take over the care of the lawn and thinks dandelions are EVIL? First of all, realize that dandelions exist in every single continent on earth. They were brought to America on purpose to provide nutritious greens in the early spring. If you have ever tried to remove them, you will realize they have really deep tap roots. If you leave a piece behind, it will re-grow. Those tap roots are actually going deep into the earth and bring up very valuable minerals. 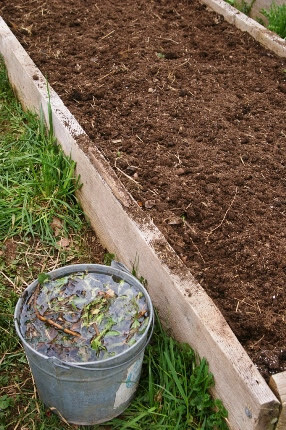 If you do dig up dandelions, you can soak the roots in water and make dandelion root tea, a magical fertilizer water that gives those minerals back to the plants. I do the same thing with comfrey. Last year I made dandelion root tea to feed my veggie garden. Many people eat dandelion greens. We occasionally have folks ask if they can harvest ours because they know we are all organic. They are incredibly high in potassium, vitamins A and C, and antioxidants. They are a bitter green and harvested when the plants are young- that is NOW. Dandelion flowers are used to make wine. The roots are a powerful medicinal herb and can be found in health food stores in various forms. The flowers are really important for our early native pollinators. So why are we dumping millions of pounds of poisons on our lawns to kill them? We do have corn gluten in stock and many folks are buying it. This is a weed seed inhibitor. It does NOT kill existing weeds. It STOPS weeds from germinating (think crabgrass…). It is still a bit early to put it down as the weather has cooled off. We usually say to apply it not only to prevent weed seeds from germinating but also as your first lawn feeding in the first few weeks of April.